What do you do when your own dog attacks another one of your dogs? Can it happen only to those who don’t have control over their dogs or can it happen to anyone? The answer is a simple one: It can happen to anyone at any time in any place. I am asked a lot about dog attacks and what makes dogs aggressive. I am asked a lot about what can be done when one family pet goes after another family pet. 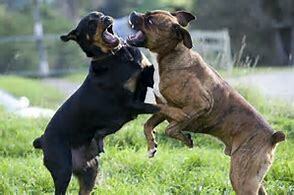 When one dog attacks another dog, it can happen for many reasons or it can happen just because it happens. We may never know the reason why. And it can happen to the best of us who work with our dogs on a regular basis. I know this because it has happened in my world twice. I’ve owned dogs since I was a little kid. In that time frame, I have had two separate times when one dog has gone after another. The first time was about twelve years ago when my normally calm and mellow yellow Lab, Cotton, suddenly attacked my Border Collie, Cricket. Cotton and Cricket had grown up together from puppydom and now lived the carefree life of being my dogs. I don’t know what happened as I was out of town and my niece was staying with my dogs. She contacted me very upset saying Cotton had attacked Cricket and had torn a hole in her skin. What should she do? The hole wasn’t big enough to warrant a vet visit, so I told her to keep them separated and I’d deal with it when I got home, which would be the next day. Normally Cotton was so calm and mellow that I never once was concerned for her behavior. But I saw first hand what Cotton did to Cricket and what she could do. Poor Cricket didn’t know what happened to her. I figured out that Cricket was standing next to Cotton when my other Lab, Coal, would run up to Cotton and nip her on the rear in order to get her to play and then he’d take off. Unsuspecting Cricket, just standing there watching, ended up being the target of Cotton’s displeasure. I kept them separated until I could start rehabilitating them together. That was the key for them. In order to make dogs friends, they must be walked together. Birds fly, fish swim, and dogs walk. It’s the best way to create a pack. If your dog got loose, he wouldn’t just wander around alone, he would buddy up to another stray. That’s what usually happens. In any case, Cotton never did attack another dog ever again. The second time I had one dog attack another happened just last week. One of the dogs in my pack, Cinder, a Viszla-Pit mix, suddenly started going after my eldest dog, a small miniature Schnauzer named Finn. Cinder is normally a very fun dog who loves everyone and every other dog. She even enjoys my cat. However, lately, I’ve noticed a slight change in Cinder. She seems to get to her threshold of what she’ll accept when she’s playing and then she gets tired and lets the other dogs know she’s had enough. Of the seven dogs in my pack, only three actually play and that includes Cinder. The day of the attack was a perfect storm. I had workmen at my house and had to put the dogs outside. Normally that’s not an issue, but the excitement level was what caused the fight to happen. Finn is old and he’s a bit of a curmudgeon. He tries to play but he comes across as being a bully. I heard a squeal coming from outside and I saw from the window that Cinder had a hold of what I thought was the drip line hose, but I quickly saw that she had Finn in her mouth. While Cinder is a small dog, Finn is even smaller and he’s more delicate. Cinder could’ve killed him had I not gotten out there. She wasn’t trying to warn him off. She was in full attack mode, which she had never been in before. I scooped up Finn and immediately took him to the animal ER and he turned out to have punctures all over his head and neck area. Had she wanted to kill him, she easily could’ve done so before I got out there, but she didn’t. Does that mean I’ll trust her completely in the future? No. Will I find her a new home? I don’t believe that is necessary. I will be keeping them separated until I feel like it’s a good time to start rehabbing them together. Finn needs to fully heal before that will happen. In the meantime, the rest of the household has been quiet. Yes, I work with dogs and have done so for more than twenty years. It does happen even to those of us who work with dogs. What we must remember is that no matter how domesticated dogs are, they are still animals first. Then they are canine, and then breed. And in Cinder’s case, she’s the best and worst of two breeds. Finally, they are our fluffy children. If we go straight to that and don’t honor who they are as living, breathing creatures with internal limits and triggers, and thresholds of their own, we do them a disservice. This can and will be remedied in my home. They are currently separated and Cinder is seeing the vet this week. However, what if this happens to your dogs or your neighbor’s dogs? The best thing you can do for your pets is to take them immediately to the vet for a check-up and blood work. It could be something as simple as a blown thyroid, which can make some dogs aggressive. It may be caused by something you’ll never know or understand. Some dogs can be wired differently than other dogs and that can cause a real behavior problem. As long as a behavior issue is not caused by a physical issue, any behavior can be rehabilitated, even dog attacks. Trust me.